We Manufacture Rotogravure Printing Machine For BOPP, Rotogravure Printing Machine For PET, Rotogravure Printing Machine For PE, Rotogravure Printing Machine For Aluminum Foil, ,Rotogravure Printing Machine For Plastic Food Bag, ETC. This Rotogravure Printing Machine Is Suitable For Multi-Color Once-Through Continuous Printing For Roll Film Materials With Excellent Printing Performance Such As BOPP, PET, PVC, PE, Aluminum Foil And Paper, Etc. It Is Composed Of Unwinding Unit, In-Feed Drive Unit, Printing Units, Drying Units, Out-Feed Drive Unit, Rewinding Unit, Electrical Control Section And Control Gauges. 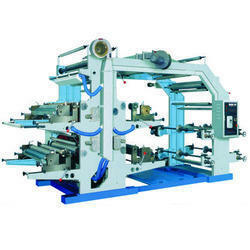 This Is The Idea Rotogravure Printing Machine To Print The Different Type Material. 1 Equipped With Microprocessor And Can Correct The Deviation Of ColorRegister Quickly And Accurately. 2. In 7" Touch Screen Man-Machine Interface, With Web Video. 3. External Un/Rewinding Section, Non-Stop Material Splicing. 4.Closed Oven And Independent Heating Hot Air Blowing System, AutomaticConstant Temperature System. This Rotogravure Printing Machine Is Suitable For Multi-Color Once-Through Continuous Printing For Roll Film Materials With Excellent Printing Performance Such As BOPP, PET, PVC, PE, Aluminum Foil And Paper, Etc. It Is Composed Of Unwinding Unit, In-Feed Drive Unit, Printing Units, Drying Units, Out-Feed Drive Unit, Rewinding Unit, Electrical Control Section And Control Gauges. Diaphragm-Type Pneumatic Ink Auto Circulating System. 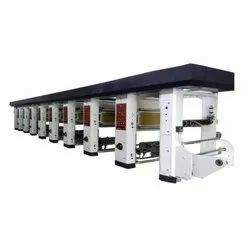 Flexo Label Printing Machine Companies In Ahmedabad We have earned strong presence in the domestic and international market by consistently manufacturing and exporting a quality range of 4 Color Flexographic Printing Machine. This machine range is manufactured at our fully incorporated production unit by making use of unmatched quality cast iron and cutting-edge technologies. Our offered 4 Color Flexographic Printing Machine is utilized to print glass paper, roll paper, PE bags and PP bags in two color patterns for packaging items in supermarket, food and garment industry. Duplex System having Two Unwind & Two Rewind Stations to print two rolls/jobs at same time simultaneously. AC Digital frequency drive on main motor. Helical Gear for smooth running and long life. All rolls are dynamically balanced and hardchrome plated. Quick Changeover of Plate Cylinder to reduce the down time. Repeat Print of Plate Cylinder for 1200mm (48") as standard model. Auto stop for web break. Individual air controller for each station. Impression rollers and Anilox rollers are dynamically balanced, ground and hard chrome plated. Helical gears for reduced play, smooth movement and long life. 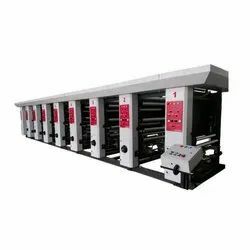 The Flexographic Printing Machine Modulate Design With Arched Bridge Stack Type. With Many Years Of Worthy Experience Let This Model Stand Out For Its Economic Efficiency And High Precision Printing. The Continuous Up-Dating And Improvements Carry Out To The High Versatility And Easy Operation, Particularly For Rather Long Printing Runs On All Extensible Plastic Film. Therefore We Consider This Flexographic Printing Machine As The Most Successful One In The World Markets. Hm, Hdpe, Ld, Lldpe, B.O.P.P, Polyester, Polypropylene, Foam Sheets, Paper, Aluminium Foil Etc. · Ribbed Anti Vibration Cast Iron Body (C.I) For Vibration Free Printing. 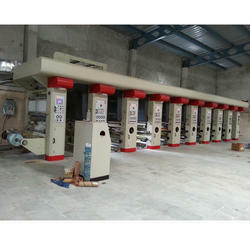 · Duplex System Having Two Unwind & Two Rewind Stations To Print Two Rolls/Jobs At Same Time Simultaneously. · Ac Digital Frequency Drive On Main Motor. · Infeed And Outfeed System Provided To Maintain Tension & Good Registration. · Auto Stop For Web Break. · Helical Gear For Smooth Running And Long Life. · All Rolls Are Dynamically Balanced And Hardchrome Plated. · Silent Air Drying System Fitted With High Velocity Centrifugal Fan. · Quick Changeover Of Plate Cylinder To Reduce The Down Time. · Repeat Print Of Plate Cylinder For 1200mm (48") As Standard Model.